We no longer offer catering, so you are welcome to bring in your own food or arrange your own external caterers. Doing your own catering is probably cheapest and you can get exactly what you want ! 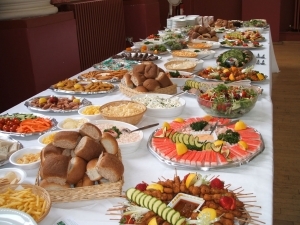 But if you’re busy or would simply prefer an external caterer then you can get the best prices from local external caterers by asking friends or searching the internet. We can open the function room up prior to the event ( normally from 1pm onwards on the day of the event ), and will secure the room again, until the start of your function. All we politely ask, is that you clear away any surplus food at the end of the evening. Sorry but due to Health & Safety & Insurance reasons we cannot allow any access to our kitchen facilities, nor can we provide any freezer or cold storage space, please take this into account when arranging delivery of your catering.